Master the skills and techniques. 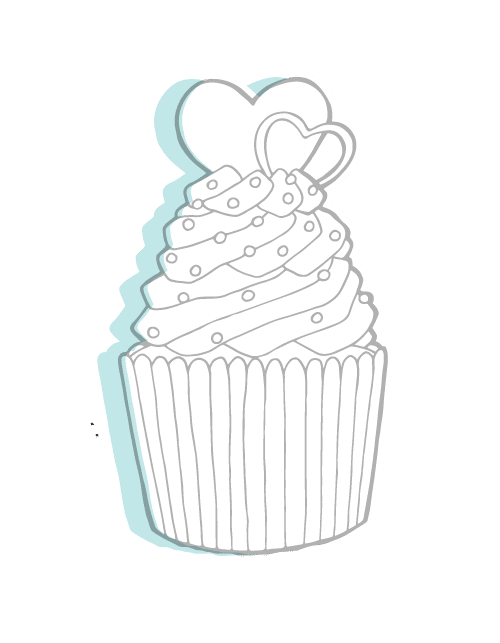 Become the cake maker you've always dreamt of! Gift vouchers available. Need some balloons with your cake? Just a quick note to say how pleased we were with the Elsa cake you made for us - it was fantastic and our daughter was absolutely thrilled. It tasted delicious too! We will definitely look to use you again - and recommend you to others! On behalf of everyone at Hammersmith United Charities, a massive thank you for the beautiful (and delicious) cake! The hand painted image looked perfect and everyone was very impressed. I just wanted to drop you a quick note to say thank you so much for my skiing cake. Everyone at the party thought it was the most amazing cake they had ever seen and they were so impressed how you had managed to characterise me so well. To top it all off everyone said it was delicious! Thank you so much again and I thought you might like the below photo for your records. The dinosaur cakes were perfect. They looked amazing and tasted great. I’ve already had questions from the other parents about you. Thank you so much! Once again a huge hit sensation. Jasper was over the moon - he got the monster truck of a lifetime. Thank you so much for the absolutely beautiful cake Gina. It was gorgeous and loved by all. I will be ordering all my future cakes from you for sure! Gina made a special cake to celebrate our boys being blessed as deacons at church. Not only was it a work of art, but all friends and family who shared it with us agreed it tasted sublime. A masterpiece that complemented a momentous occasion. Thanks so much Gina! Just wanted to say a BIG thank you for the beautiful and yummy cake! It was gorgeous and we got a lot of comments on how beautiful it was and that it was delicious. We'll be sure to pass your details on to friends who need a cake in the future. We still have a bit left to enjoy! Just wanted to say a big thank you for my Nans 70th birthday teacup cake. She loved it as did the rest of the family. Such a pretty cake was a shame to cut it! Hi Gina, Just wanted to say a massive thank you for creating such a beautiful cake. It turned out just how I imagined if not better! Everybody was so amazed at the cake and we had so many comments and people asking who made it! So thank you again for getting our vision 100% spot on! Amazing! Thank you again for the wonderful pirate cakes - the children LOVED them…and the adults enjoyed polishing off the rest! I am recommending you to all my Mummy friends! A fantastic cake for my daughter going off travelling for a year. The detail was amazing and literally everyone thought it was the best cake they had seen. Not only did it look great but it tasted great too. Have found my cake maker for all future cakes. Thank you once again Gina the cake was truly amazing! Hugh's cake was an absolute triumph! Everybody loved it! So clever to get the writing on the book too. Just wanted to say thank you so much for the fantastic cakes once again. The boom beach one was not only the talk of our party but of the other two parties happening at the same time. Everyone was very complementary about the first communion cake as well. I passed out your details several times. We will be back end of June for Alexander's birthday. “Seamless service, start to finish: good customer service, worked through desired designs and made good suggestions to keep the order within budget, made an edible replica of our son’s favourite bunny toy and the cake looked fabulous! Very happy customer!" I just wanted to say thank you for the cake on yesterday. It was exactly what I wanted. It looked perfect and tasted great. Everyone was so impressed. But most importantly my husband loved it! Also the sparkler candle was brilliant!! Such a good effect when they brought it out. I hope to ask you to bake me another cake before long. Thank you again ever so much - it was a HUGE hit and lots of people asked where the cake came from. We were blown away by how accurately you captured on cake exactly what we wanted and for such a decent rate. I just wanted to thank you for the cake which was amazing! And it was delicious! I shall remember you and pass your details on, thanks so much. I wanted to thank you for my partner's Juventus logo cake. I cannot describe his surprise! All the quests admired the details on the cake and commended on your talent; really amazing and tasted lovely as well. Just a quick email to say thank you so much for the beautiful book cake and incredibly detailed and accurately drawn character biscuits. You showed such skill in recreating the different pictures I sent you. Everything tasted delicious and we continue to enjoy the little bit that is leftover! Just a short note to thank you for the cake for Tom’s Christening. It looked fantastic and made a great central display as Tom’s guests came in. I cannot describe my surprise when we met with Chantal on Friday to celebrate my birthday and she gave me the AMAZING! Cake you had made. It really made my day extra special. Thank you so much ,you are a very clever lady. Your details have been passed to several friends! Nearly 15 years ago I have had my first Ginas Cake. I have even exported them. Delicious pieces of art. Dear Gina, just wanted to say big thank you for Bobby's cake. It was stunning and he was over the moon when he saw it. The way you reproduced him and the head dress was a work of art. 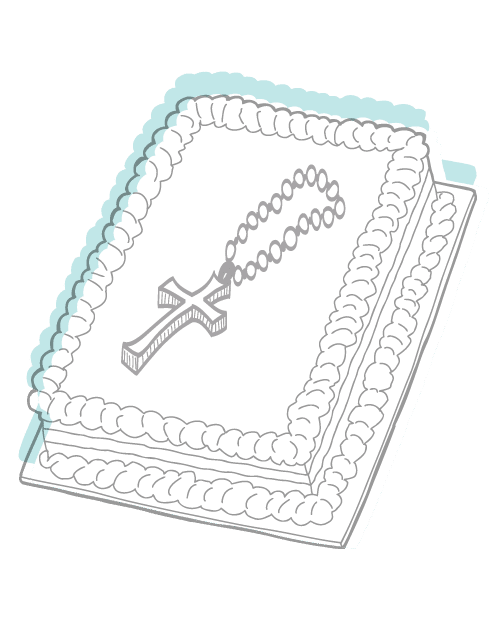 Thank you for creating the perfect cake for my son’s First Holy Communion. You listened to my wishes and produced a cake which was both age and occasion appropriate. It delighted the children and the adults and tasted delicious too. I came to Gina's cakes to make our wedding cake. Not only was it delicious and widely received as one of the best cakes our guests had ate at a wedding. The decoration and look of the cake was a huge success. My new wife was over the moon with it. And we would recommend Gina's cakes to anyone in a heartbeat. Thanks Gina! We loved it! Just wanted to say thank you for the cake you recently made for my son (RYAN) for his 16th Birthday which was delivered to my home on 31 January. We were all stunned to see how beautifully the cake was presented and the attention to detail; truly amazing and tasted lovely too! Thanks again, especially as I ordered it very late! Thank you for Georgina's baptism cake and for dropping it off. It looked fantastic and tasted great. attached is a photo of us cutting the cake with Georgina. Everyone loved it and at the end of the day the entire cake was gone, except the cute booties and a couple of her name blocks. The cake was fabulous and so tasty. Thank you very much. The cake was fabulous – my mum loved it. Thank you so much for your help! Gina that cake has to be the best to date.. Ever so soft with lashings of jam..
Everyone has commented on the freshness..
Just wanted to say Thank You for Ezra’s Dinosaur cake - it was delicious and every bit went! Thank you so much for the gorgeous cake! It was splendid and delicious. The Wedding cake was absolutely beautiful, everything we hoped for and more, it is also delicious! Just wanted to thank you for the wonderful 21st cake it was delicious. My niece was over the moon. Just wanted to say the cake was absolutely beautiful, exactly what I wanted, perfect, and more importantly my sister thought the same and everyone enjoyed the chocolate filling, there wasn't a piece wasted, was eaten straight away. 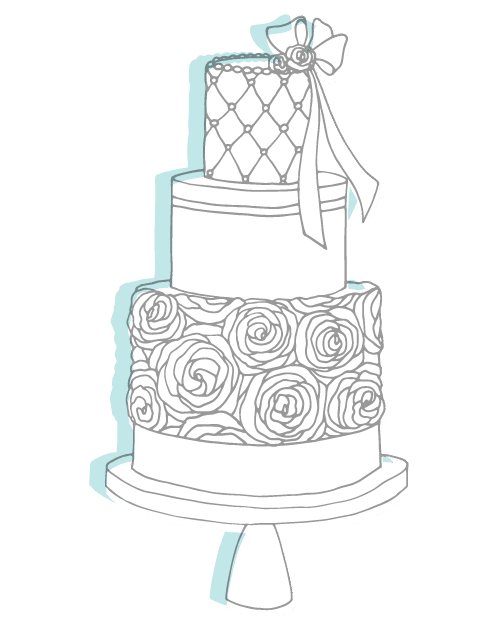 Whether it's a beautiful wedding cake, christening cake or a fun birthday cake Gina will create the ultimate centrepiece for any special occasion. 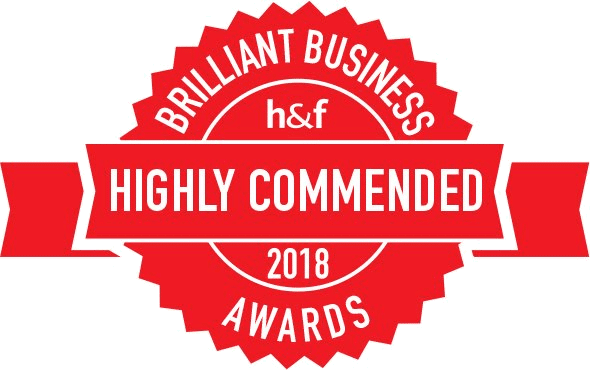 Artistic flair and attention to detail are the hallmarks of this personally run business which has been up and running successfully for over 20 years and is based in London and Surrey. All the designs are individual and hand-crafted. 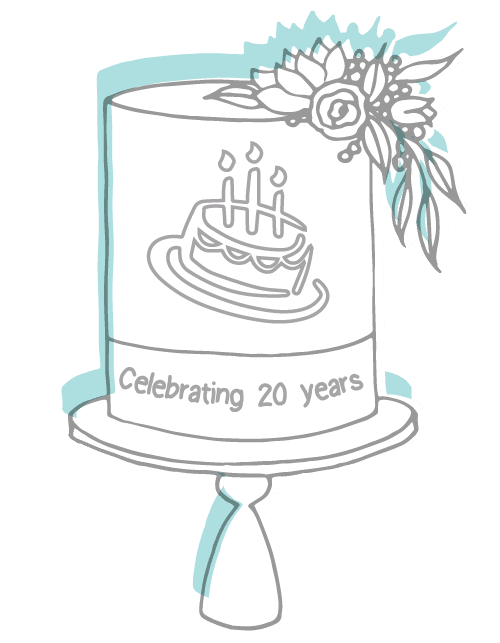 Gina is happy to spend time with each customer to make sure that the cake she provides is as special as the occasion.A selection of cake bases are available to suit every taste, from rich fruit cakes to yummy chocolate cake, sponge to vegetarian. Not only will it look great, it will taste great too! Gina can deliver within London and the home counties. 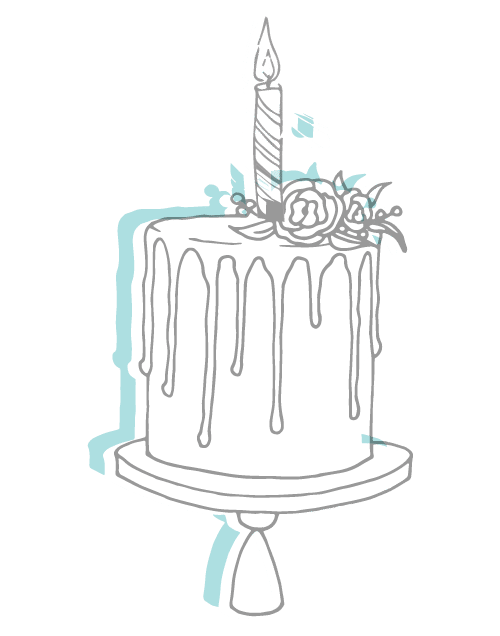 Your cake will arrive swiftly and safely, so you can relax just a little bit when you’re planning that special event and have a million and one things to do. Please look through the gallery to see a small selection of Gina’s work. You are sure to find something you like at a competitive price.